Making a transfer between rail lines can be frustrating, but it can also be a valuable bridge to getting to your destination. Without the bridge, you're stuck. But with the bridge, even if it's an 900 foot tunnel, you're much more likely to take a train, especially considering traffic on the highways and streets. With the Downtown Train Extension Tunnel (DTX), Caltrain and, later, High Speed Rail will reach the Transbay Center, giving San Francisco and the Bay Area the opportunity of a unified rail network for the entire Bay Area that is interlinked with major hubs/transfer points in Downtown San Francisco, Downtown Oakland and eventually in Downtown San Jose with the Silicon Valley BART extension. However, without a 1 1/2 block (900 foot) tunnel, there is no effective connection between Caltrain and BART. As an analogy, imagine driving on I-80 to Nevada. However, when you near the border after Truckee, the four-lane highway narrows to a two-lane highway and has a series of stop signs as you cross into Nevada. Shortly after crossing the border I-80 returns to ease and comfort of a less congested four-lane superhighway. Would you drive to Reno under those conditions? 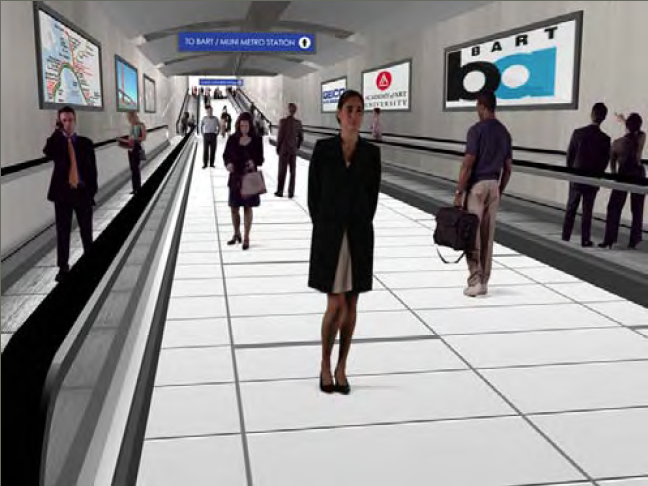 Building the pedestrian link from the Transbay Center to BART and Muni Metro is the key to the Bay Area's integrated and interconnected transportation system in San Francisco. We also have an opportunity to provide better access to Caltrain from more of San Francisco if the Downtown Extension Tunnel (DTX) is realigned down 7th Street and Mission Street with a Mission Street Station. We will talk more about this and its connectivity and transfer benefits later. 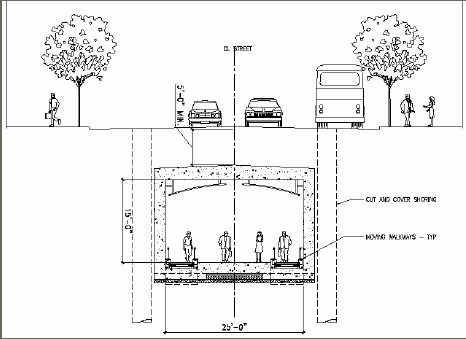 Why build a pedestrian tunnel? "While the Transbay Terminal is only 1½ blocks from the BART station, it is far enough to make transfers an inconvenience, particularly to those with disabilities or unfamiliarity with San Francisco transit systems. Even the transfer between BART and Muni within the station is often frustrating to riders. With no direct connection from one platform to the other, riders must go from the BART platform level, all the way up to the Concourse, through two faregates and then back down to the Muni level (or vice-versa)." Why should we have a tunnel? The quote above answers this. Added to that, without the tunnel, many fewer folks would make a transfer from BART to Caltrain, or Muni Metro to AC Transit buses. The tunnel would also benefit other transit service to Transbay including Greyhound, WestCat, Amtrak, Golden Gate Transit and SamTrans. 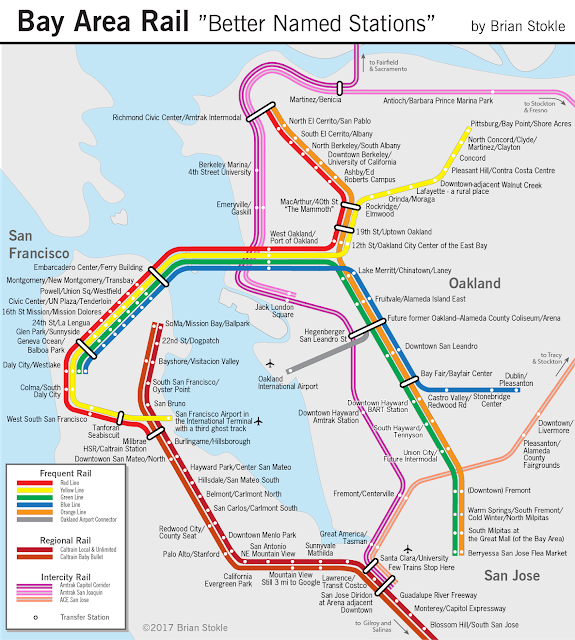 • Provide a critical link in the regional transportation network through a direct connection between BART/Muni Metro and Caltrain/CAHSR. 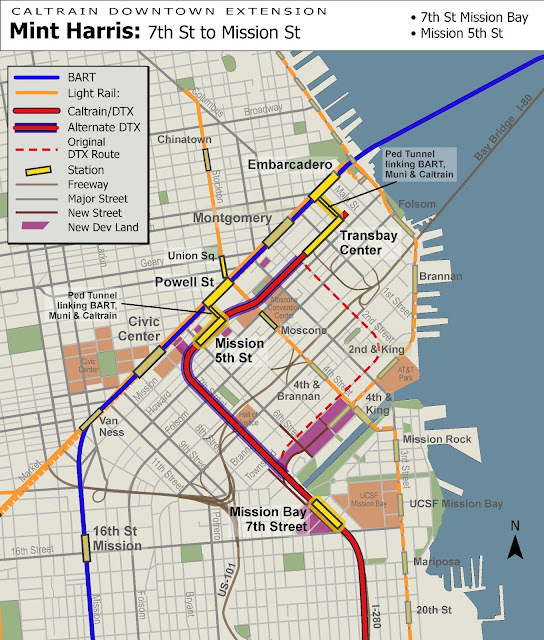 The original Transbay Terminal FEIS called for the tunnel to reach Embarcadero Station via Fremont Street, but it could also run under Beale Street. 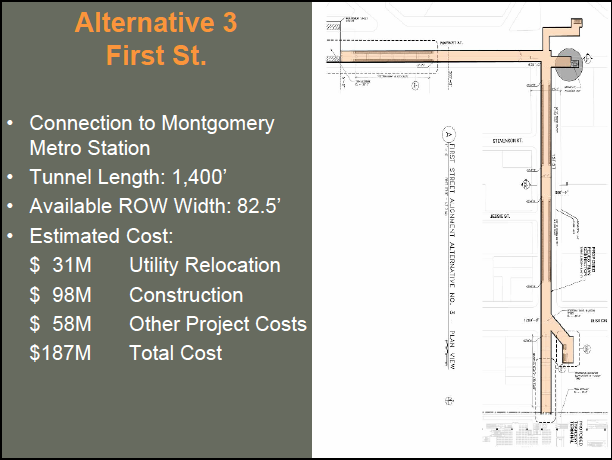 Likewise, a tunnel to Montgomery St. Station could go under First Street, zigzag through Ecker Place or via Second Street. Similarly, the BART Embarcadero Station Access Plan of 2002 recommends linking Embarcadero Station with the lower level of the new Transbay Center. The challenge so far has not so much been the idea of the tunnel, but who will pay for it. Under the Transbay Center's Phase 1, the tunnel is not funded, and instead considered for Phase 2 which is not yet fully funded. So who should pay for it? All groups that would benefit from it! BART owns and operates Embarcadero Station with Muni running trains there. The Transbay Center is being planned by the Transbay Joint Powers Authority (TJPA) with transit operations run there by Caltrain, AC Transit, Golden Gate Transit, Muni, Greyhound, and future California High Speed Rail. Of course all of this is happening in the City of San Francisco. From a scan of the internet, it appears that none of the parties are funding such a tunnel, even though most would gain from the easy transfer that would likely boost ridership. In other words, unless a large pile of money comes from the Federal government or elsewhere, everyone is saying, "I'm not going to pay for this since it's up to the others to pay for it." That's the way it appears, at least. To tunnel to Embarcadero or to tunnel to Montgomery. Below are a series of drawings showing the alternative tunnel alignments to get from the Transbay Center to either Embarcadero or Montgomery St stations. 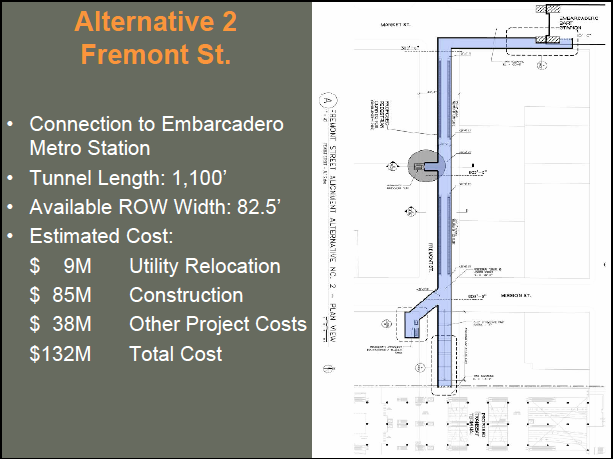 The study notes that the Fremont and First Street options would be longer and more costly than the Beale and Ecker Place alternatives. Below are preliminary specifications and cost estimates of each tunnel. To summarize the alignments, we look at their paths, station destination, tunnel length, and estimated cost. 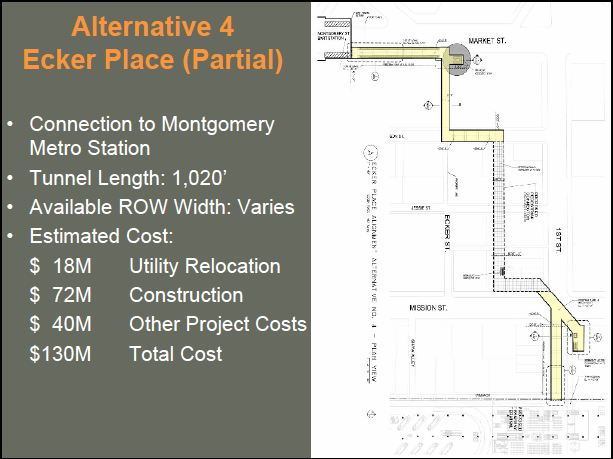 The four studied alignments studied are listed plus a Beale Street Phase 2 and a Second Street option with estimated differences in cost. 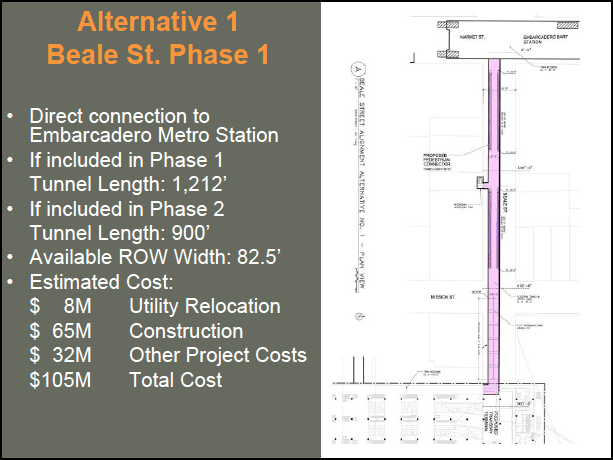 Initially, based on cost and length of tunnel, the Beale St and Fremont alternatives look the most promising. Each option was further evaluated and given a score under three broad criteria: user experience/convenience, cost and constructability, and technical feasibility. I have added in my scores and points for alternate alignments which are not numbered. Note that the criteria also considered that BART stations with continued growth would reach capacity in the coming years. Embarcadero Station is somewhat more challenged with its smaller, more narrow platform. However, if the side platform (aka saddlebag) solution is built at both stations, the capacity challenges at both will be mitigated. Shorter Alternatives that do not reach the station, but have a tunnel part of the way. The bottom line is that the Fremont Street and Beale Street tunnels to Embarcadero Station are the best. They cost the least, disrupt traffic and/or require the least utility relocation, and they still get people between the two destinations within a tunnel, fully bridging the rail systems. The closest "cheaper" alternative is building a tunnel only part of the way; from the Transbay Center to Market Street, but that would require people to surface at Market Street, walk several hundred feet along sidewalks and then descend at Embarcadero or Montgomery Street stations. Although cheaper, requiring people to go up and down is a virtual deal breaker. Simply put, many fewer people would make such a transfer without a convenient single level transfer (between the Transbay Center's Lower Concourse and the BART/Muni Metro station concourse). Finally, it appears that the TJPA may have selected a preferred option. A recent TJPA document (a prep for a Supplemental EIS/EIR, 04/29/2013) calls for several changes to Phase 2 Transbay Center/DTX planning including a widened "throat" of tracks entering the Transbay station box, adding a bike ramp to a Bike Station in the Transbay Center and also "an alternative alignment for a BART/Muni pedestrian connector (ped tunnel) under Beale Street." 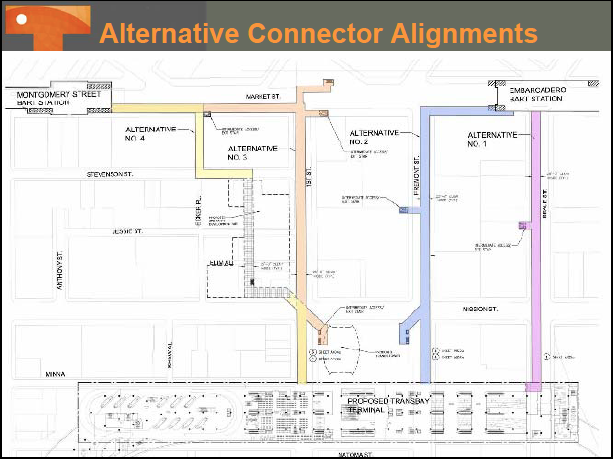 The initial EIS/EIR had only covered a pedestrian tunnel under Fremont Street. We recommend the Beale Street tunnel because it the shortest tunnel option, cheaper to build in Phase 2, and interfaces with the BART/Muni Metro Station concourse relatively well. The only down side of Beale Street is that it only takes you to Embarcadero. Building a tunnel to both stations would have provided more versatility, but would be dramatically more expensive. Isn't the tunnel too long? Will people really use it? A better example would be an airport, metro or commuter rail tunnel example. So there are examples in the real world of equivalent distances. They happen to be either in very large dense cities or at a critical busy hub. Below are several tunnel lengths including the Beale and Fremont Street alignments and several other pedestrian tunnels in the USA and abroad. 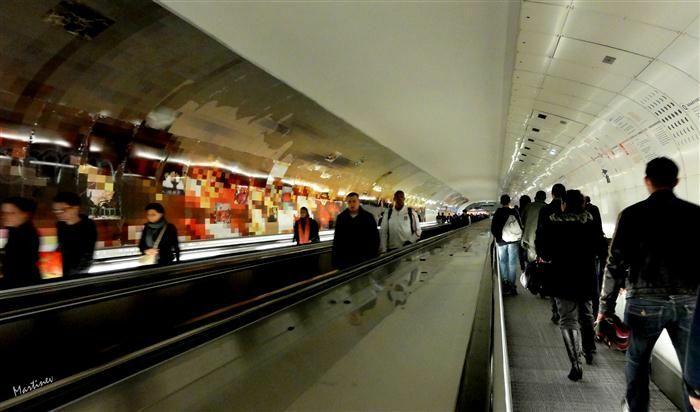 Based on these examples, many of which have moving walkways, the distance is not unreasonable, especially when it links 2 very busy transit centers like Embarcadero Station and the Transbay Center with Caltrain and High Speed Rail. The projected daily transferring of 13,350 riders would seem to justify such a link. I wonder how many would make such a a transfer without a tunnel. I can imagine it would be 30-60% fewer people. 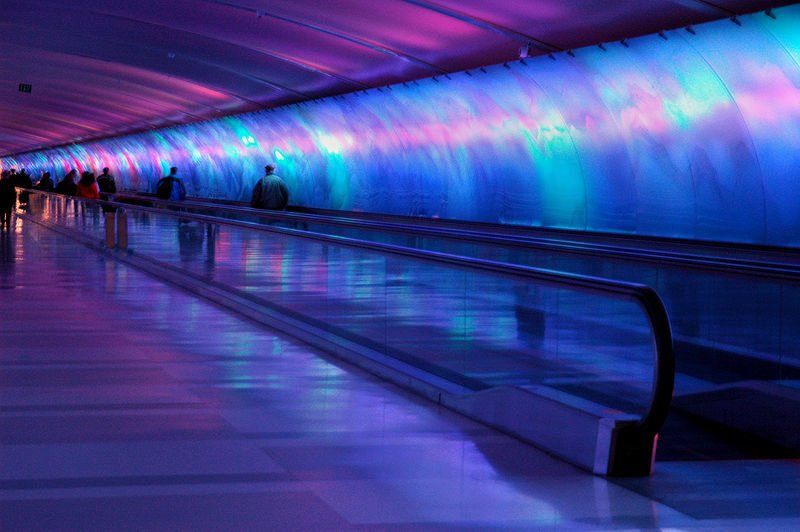 Terminal 1 pedestrian tunnel (800 feet) at Chicago O'Hare Airport. 24% use Caltrain and 10% use BART. Of course some people will use the tunnel who don't transfer, and there are those who will be going from one mode to CAHSR, Golden Gate Transit or Greyhound. The 2007 tunnel estimate for Beale Street was $105 million. Let's assume that number has risen to $150 million. If that total is divided up whereby all parties involved paid a share, with the major agencies paying large shares (Caltrain, AC Transit, and Muni) and the other groups paying a smaller share (BART, CAHSR, Golden Gate Transit, TJPA, Greyhound, Amtrak, WestCat, SamTrans, and the City of San Francisco), it would seem that some sort of financing could be found. If you throw in an application of Federal funding that is a match, then the local agencies would only need $75 million. Divide that by 12 agencies and you could have the high users pitch in $10 million each and the smaller agencies pitch in $4.5 million. I realize this isn't always the way things are done, and that in reality it would be a lot easier if only one, two or three groups helped fund the pedestrian tunnel. That said, it would seem up to the Metropolitan Transportation Commission to lead the way to help finance this tunnel that is so vitally important to the regional transportation network of for a metropolis of 7 million people. 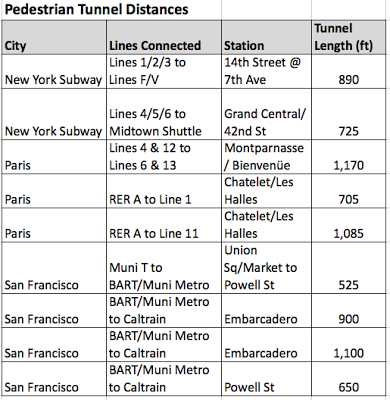 As you can the chart above regarding tunnel lengths, I have also indicated that if a Mission Street Caltrain Station were created at 5th St and Mission, the tunnel linking it to Powell Street BART/Muni Metro station would be 650 feet, or 27% (250 feet) shorter than a similar tunnel connected to the Transbay Center. A new Caltrain Station linking to Powell Street would allow South Bay and Peninsula residents much easier access to the Union Square shopping district and job centers along the Mid-Market Corridor. Likewise, San Francisco residents from the Sunset, Haight, and Nob Hill could access Caltrain more easily with this station that is much closer than the Transbay Center. The ridership projections for such a scenario are unavailable. True, some riders originally using Transbay would switch to Mission and 5th, but many more untapped commuters and shoppers would use such a station. I mention this idea once again because Caltrain is not merely a train to get to San Jose or Silicon Valley. It's also a train that could benefit much of San Francisco. In other cities of the world, whether Tokyo, New York, Boston, Paris, Madrid, London, Istanbul or others, their commuter rail lines have multiple stops within the big city before getting to the terminal station. San Francisco has only 2 stations (4th & King) and 2 planned (Transbay Center and Oakdale/Bayview). We could make Caltrain operate just as BART does, a commuter rail line that has stations spaced out in the suburbs, with close in stations in the city center. Paris does this best with its RER system which is similar to BART in its station distances, but similar to Caltrain in its technology of using commuter train sets with overhead electric wires. My point is that we could have several stations stopping along the Caltrain right of way leading to the Transbay Center. In Paris average distance between RER stops in the city center is 1 mile. 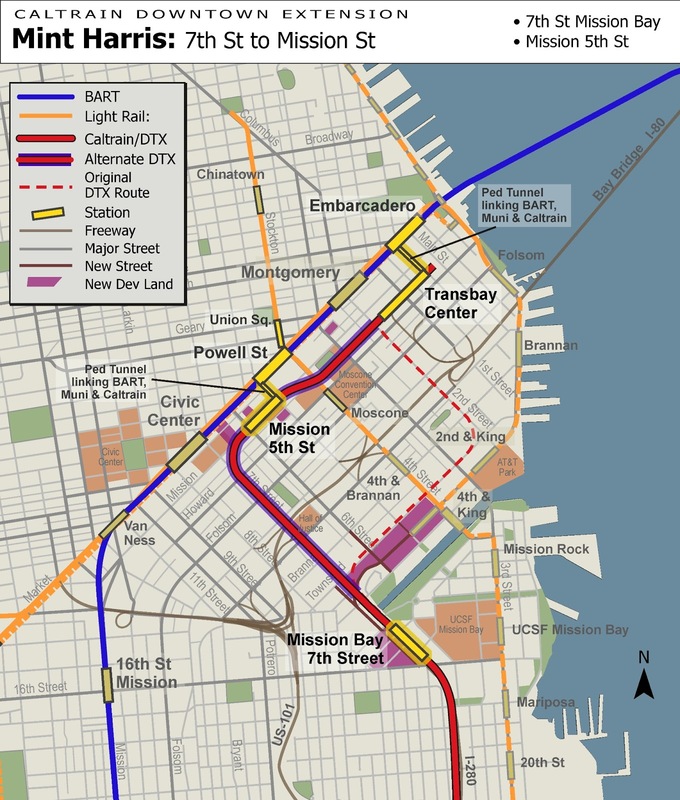 At that rate, regardless of the DTX rail alignment, we should have 4 stations: 22nd Street, Mission Bay, 4th & King or Mission & 5th and Transbay Center. 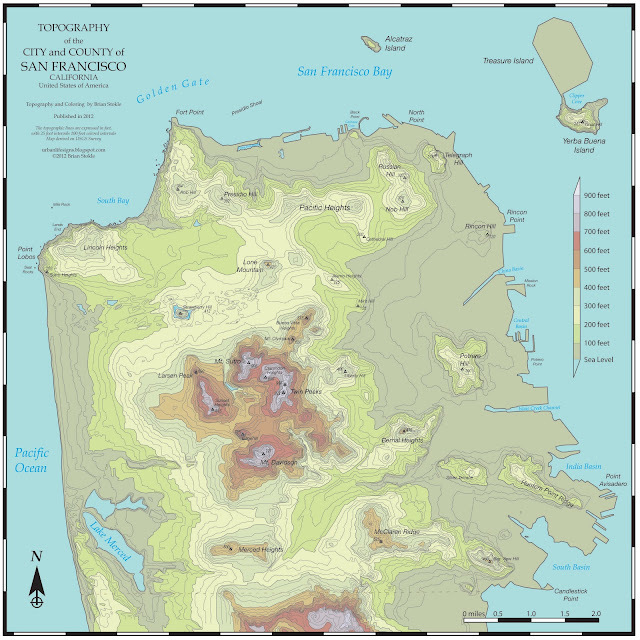 I ask, which stations would better serve the region, residents of all of San Francisco, and the economic growth of San Francisco's greater downtown? To learn more about the Transbay Transit Center, you see a video featuring Peter Coyote, or go to the Transbay Transit Center website, just be ready for the video on the homepage with music to start immediately. Should include space for a bikeway as well. 3. Bike on designated 2-way bike path through tunnel (if I understand your suggestion). 4. Walk bike through Transbay Center Lower Concourse to Caltrain stairs with bike channels. 5. Walk bike from stairs through Train Level to Caltrain bike car. So is the benefit of adding a bike lane in the pedestrian tunnel worth it. Based on the designs of a 25 foot wide tunnel that has 2 moving walkways (~5 feet wide in total), which only leaves 13 feet of room. I don't believe this is enough room for both bikes and non-moving walkway pedestrians. So the tunnel would need to be about 8-10 feet wider to accommodate such a bike path. How much would this cost? I don't know. Would cyclists really benefit that much from biking 900 feet when they would be walking before and after the tunnel? (I don't imagine there are any plans to install a bike path through either concourses). 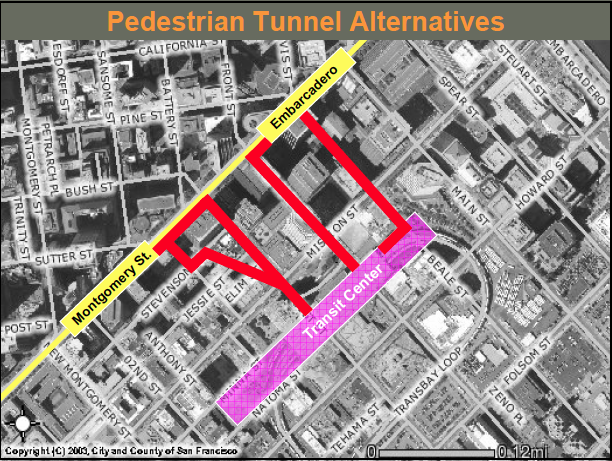 Note also, that if the pedestrian tunnel is built under Beale or Fremont streets, it will be at the EAST end of the Transbay Center. 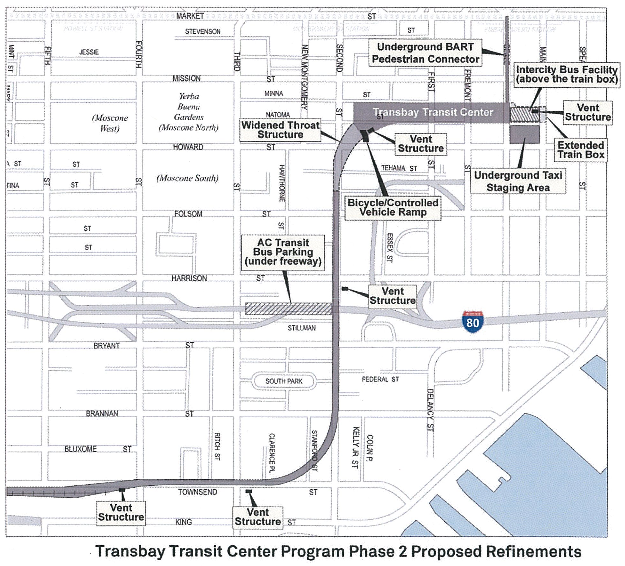 The planned Transbay Bike Station is planned for the WEST end of the Lower Concourse. Unless the cost were not much more than the narrower tunnel AND the benefit to cyclists was great, I'd be inclined to support such a bikeway. However, I don't see the costs being low enough nor the 900 feet of biking meriting such a bikeway. That's just my opinion. I'd love to hear counterarguments. There is funding available for an underground passage in the form of CA Prop 1A (2008) which is a bond measure that provides both SF Muni and BART with funds for connecting to the HSR line, which is precisely what a tunnel would be doing. I don't believe that money has been programmed yet by those agencies so it's still available. Do you know of any other official document that indicates funds being explicitly given to these two groups (or TJPA) to build a ped tunnel connect BART/Muni Metro to the Transbay Center? I'd love to see it. Anonymous: I don't think so... bikes should be accommodated on the surface. You wouldn't expect many people with bikes to be transferring from one transit system to another, anyway, and they'd still be able to walk through the tunnel with the bike.